Why banks want to know your credit score - FreeEconHelp.com, Learning Economics... Solved! Ever wondered why banks want to know your credit score? The reality is that it helps them to manage risk, by choosing higher interest rates for those people who seem more risky. And it is a lot easier for banks call another company to ask about a number than it is to research your life history and confirm your story and references, etc. We can imagine the loan process as a typical supply and demand graph (with the interest rate for price on the Y axis, and quantity of funds loaned on the X). 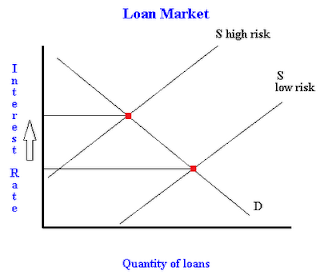 The supply curve would represent the supply of loans (given different interest rates) which would be upward sloping because banks would be motivated to loan more money given higher interest rates. The demand curve would represent consumers looking for a loan, and would be downward sloping because consumers would take out more loans if they could get a lower interest rate (everything else equal). Now let's complicate it by taking away our perfect information assumption. If banks cannot tell the different between a low risk and high risk loan, then it is in their best interest to treat every loan as high risk. 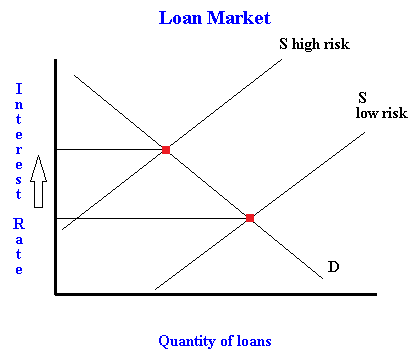 This increases the costs associated with the firm (because they plan for high risk loans) which shifts the supply curve to the left increasing interest rates and decreasing quantity of loans. However, with your credit score information, banks can distinguish between the high and low risk consumers and charge an appropriate interest rate. In essence, your credit score is a signal sent to banks showing them how safe or unsafe an investment you are. This is why it is imperative that you know what your credit score is, because it could have dramatic effects on the interest rate you pay for a loan, as detailed above. It makes sense to search around for a free credit score offer. There are various companies on the web that do this, just make sure to read the fine print and if the offer seems to good to be true it probably is. Also, remember that if you are turned down for a loan (or even a credit card) you have a right to freely access the information use to make that decision. Finally, banks ONLY see your credit score and credit report, they don't know why you missed a payment, or your personal story. This is why it is imperative to check your credit report occasionally to make sure that all of the information is accurate. You would not want to be turned down for a car or house loan because something was present on your credit report that was not factually correct. I've also been thinking about it this month. My financial situation improved thanks to the knowledge of this: Non ChexSystems Banks (Updated List) Does anyone here have any experience with it? Hi, nice and useful information, Personal loans is the thing which plays a major role in most of the peoples life by solving their issues at certain situations. But getting these low interest personal loans is the thing is still night mare for lot of people, Choosing the right person (or) firm which can help in getting these loans is more Helpful.